After our stop at the Sigvaris headquarters at Peachtree City, GA, Sekyen and I boarded our final flight to Sarasota, Florida. It was an emotional landing as we finally completed our world tour. We are going to spend a few days decompressing at Martha’s Vineyard, MA then onto a hike in NH/Maine. We will stay in the east coast standard time zone for a bit of recovery. As discussed and instructed before race time, I stayed upright and injury-free during my final leg of “Around The World In Less Than 30 Minutes.” Due to my previous five races we thought we had enough time accumulated to enjoy this last continental mile race, so I went out in the first half of the race at about 2:28 and then just cruised into the finish enjoying the sights and sounds of the final 1/2 mile in 5:13.92. With 3 elevated sidewalks to cross over and 5 roundabouts to run through, this flat course had a few obstacles to be careful of as I raced. The sixth and last race of our world tour took us to the Townsville Running Festival in Townsville, Australia. Townsville is a beautiful spot in northeast Australia that is about a three hour boat ride to The Great Barrier Reef. 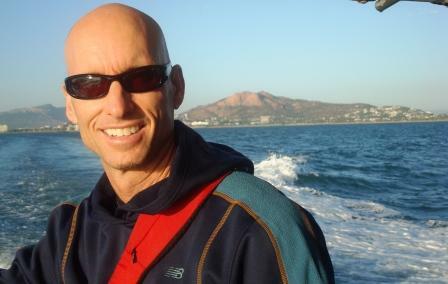 Here is a photo of Townsville behind me (with majestic Castle Hill in the background of Townsville) on our way snorkeling to The Great Barrier Reef. The McDonald’s Townsville Running Festival has a marathon, 1/2 marathon, 10K, and a 5K. President of the Townsville Road Runners, Anthony Hockings (in photo above with sign), and Race Director, Brian Armit, were kind enough to stage a special one mile course for me. We were happy to complete our world tour in Townsville, Australia. As you can see in the video, we had trouble with my start of the race, but we finely got things right. “Around The World In Less Than 30 Minutes” was successfully completed in 29 minutes and 25 seconds (34 seconds ahead of our target goal) on August 8, 2010. I know many of you have been asking me about 2011. We are in the planning stages of another world event and we will announce the 2011 event very soon as we confirm locations. 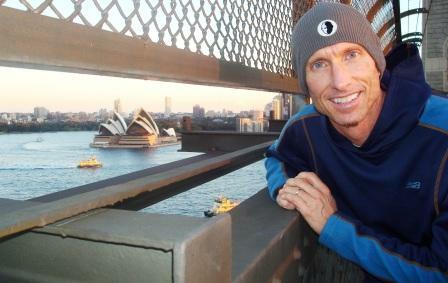 For right now, Sekyen and I will enjoy a few days in Sydney before flying back to the States. We stop in to see our HeadBlade sponsor in LA, marketing director in Phoenix, Sigvaris sponsor in Atlanta, and then finally back into Sarasota for a few days of rest on August 18th. Thank you all for your constant support. It has been an unbelievable event that we will always remember. My second speaking presentation took place on August 30th at the Hotel Savera, www.saverahotel.com. 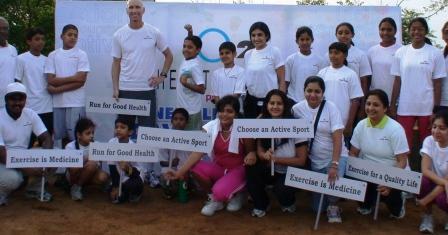 This was a fitness talk sharing our new ideas for injury prevention with the audience from Chennai. 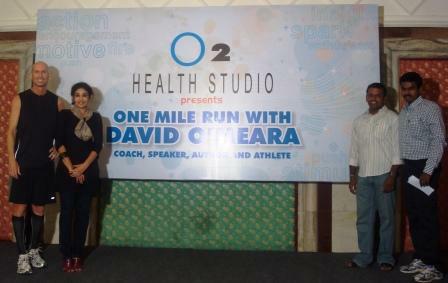 Not only was Savera Hotel our sponsor for the week, but also the O2 Health Studio, www.o2healthstudio.com. 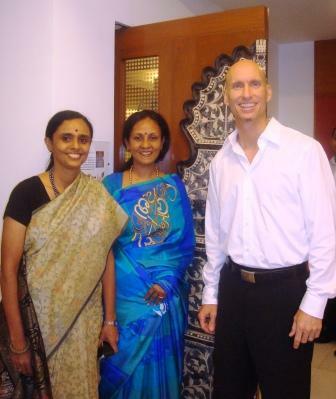 Nina Reddy, Executive Director of Savera and O2, was an exceptional host. She is a progressive leader seeing the boom of fitness in India before it happened. Below is a photo with Nina and two members of her fitness staff – Dinesh Vallavan and Earnest Vijay. It was a wonderful evening as the audience was eager to learn new ways to exercise without creating injuries. Then it was time to race on Saturday morning…race #5 in Chennai, India representing the continent of Asia. Here is an excerpt from my speaking presentation at Global Adjustments on my new book, Creating Amazement. I wanted to thank all the staff at Global Adjustments. Not only Ranjini and Usha, but also Chandrika Raman, VP of Business Relations, and Anupama Arvind, VP of Sales, and the rest of the extremely hospitable staff. Thanks also to Sankaran Raghunathan and Sundari Ramakrishnan, Dean and Assistant Dean of The National Management School for attending my presentation and arranging to have my talk webcasted live.